A native to eastern North America. A very impressive, large, rugged-looking tree. Leaves are lustrous dark green above and whitish underneath, alternate, simple, 4" to 10" long, about half as wide, obovate to oblong-obovate, rarely rounded at the base. Leaves are shaped like a base fiddle. Bark is very rough, developing a deeply ridged and furrowed character, dark gray in color. Round or egg shaped 1" to 1 1/2" acorns are almost completely covered by a mossy-looking cap. 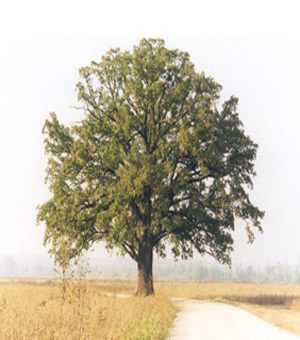 Very adaptable to various soils and more tolerant of city conditions than most oaks. Slow to moderate growth rate.